We often refer to the Kanban card as a work item; task. With the card linking feature, you can group cards together and create a network of cards (Relative cards) or you can break down a card and create a hierarchy turning a single card into a Project (parent card) that consists of 5 smaller cards/tasks (child cards). The feature allows you to create a rule of order in the breakdown of your work via dependencies between the cards (sucessor/predecessor). 2. How to link cards? 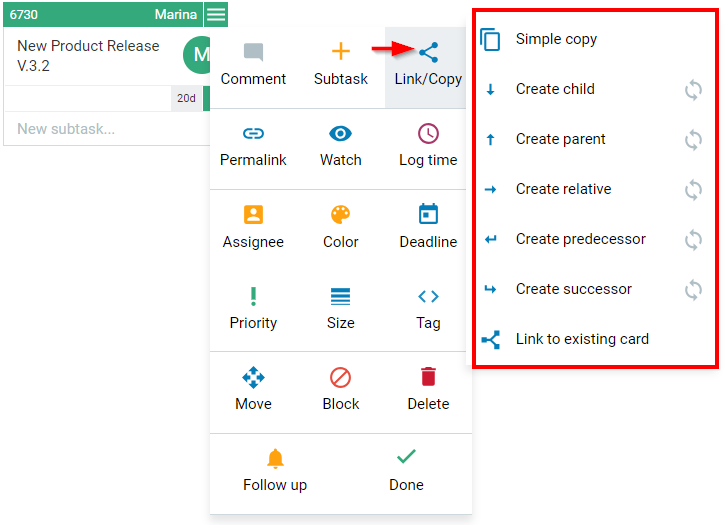 Press the CRTL key and Drag & Drop the selected card on the top of the card you wish to link it to -> select one of the link types from the drop-down menu to define their relation: parent/child/relative/predecessor/successor. The cards will be automatically linked to each other. 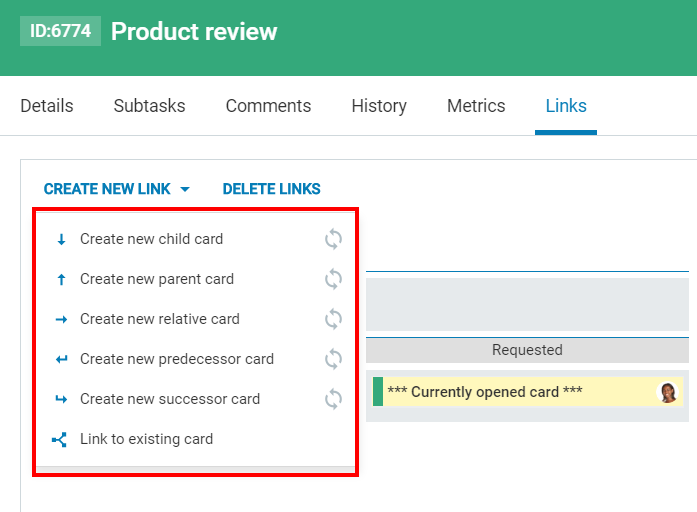 Open the context menu from the upper right corner of your card → select Link/Copy → choose the type of relation -> position the card on the mini Kanban board ( define board and position) -> fill in the card details and Add it in order to create and automatically connect it to the original one. You can use the Link to existing card option to connect existing cards in the system. Enter a Card ID or a Title to refer to a card. Use the plus icon (+) to make the current card a Child; Parent; Relative; Predecessor or Successor. Just select the type of connection and enter a card ID or a Title to refer to an existing card in the system and link them -> Create a link. Open the Links tab of the card and select the Board View mode - it displays the results in a Kanban board view. For better visibility, the card, which Link's tab you have opened is colored in yellow and you can see its position on the board (backlog; requested; in progress; done). If there are any cards, linked to it (so far) on the same board, they will be also visible in accordance with their current progress status (backlog; requested; in progress; done). In the example below, the yellow card is a Parent to the three child cards located in the Requested column. TIP: Drag the cards across the view to instantly create new linked cards. Using Ctrl + drag and overlap cards will allow you to create further dependencies between the already linked cards. For example, you can create a successor/predecessor relation of the three child cards directly from the Board view mode. Open the Links tab of a card and select the Table view mode - it displays all linked cards as a list in the panel. You can use the "Configure Results" button to extend the data you get for the cards - you can easily add: description, tag, size, board name, etc. -> just click the button and select the pills from the configuration panel -> Apply the changes. Open the Links tab of the card and select the Graph view mode to see the graphical representation of the linked card. 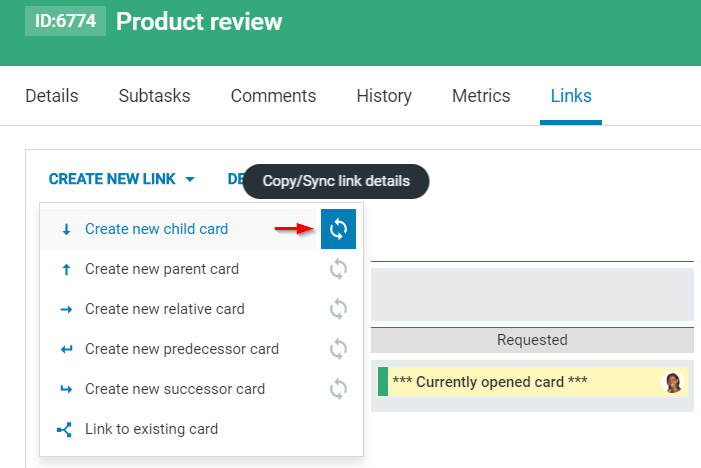 Use the "CREATE NEW LINK" drop-down menu to the top left side of the panel to create a new linked card or link the currently opened card to an existing card in the system. The "CREATE NEW LINK" drop-down menu is part of any of three display modes. Open the "Create new link" drop-down menu - select the relation you want to define (child/parent/relative/predecessor/successor) -> the system will prompt you to locate the newly created card on the mini board panel that will be displayed (select the board and the card position on the map) -> fill in the card properties and create it. The new card will be physically present on the boards once you complete the action. Use the last option in the dropdown list "Link to existing card" to connect the card which Link's tab you have opened with an already existing card in the system. Go to the sidebar located to the right of each board interface and open the Related boards' panel (1). Drag and drop the card onto the related board, where the linked card is to be created (2). After you drop the card, the link menu appears. 3. How to copy and sync properties when linking cards.